Waking this morning we knew we were in Turkey, the dawn call the prayer had made sure of that at 5.am. After a slow start we went down for breakfast before heading off to explore Bodrum. 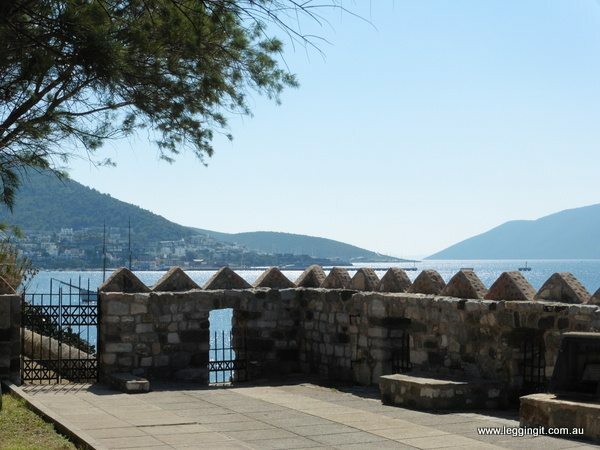 Our plan was to explore Bodrum Castle (St Peters Castle), it is situated on a peninsular surrounding the boat harbour. 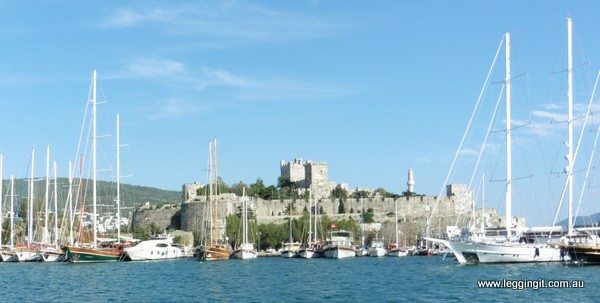 Construction of Bodrum Castle (St Peters Castle) started in 1406 and continued until 1522. 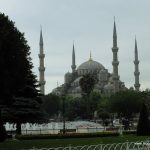 It was built by the knights of St John on top of earlier Byzantine and Turkish castles. To make lime for the mortar the knights demolished the nearby Tomb of Maussollos. Ever wondered where the word mausoleum originated from? More on that later. After the knights defeat by the Ottomans in 1523 on the Island of Rhodes, the castle and nearby Kos were surrendered as part of the terms. 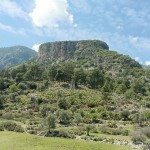 Although the castle was supposedly the strongest on the Mediterranean its importance changed as the boundaries of the empire expanded and it became a backwater. Down through the years it served as a garrison for the Turkish Army, a public mosque, a haman, a garrison for the Italian Army after WW1, a prison and after laying vacant for 40 years became home for the Museum of Underwater Archaeology. In its new role it provides an excellent service displaying artifacts recovered from various shipwrecks along the coast surrounding Bodrum. 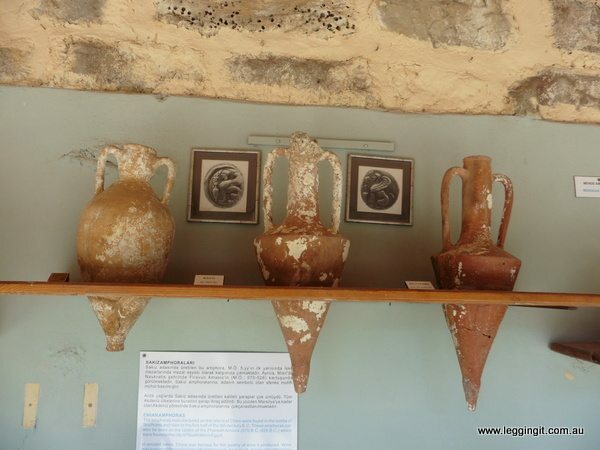 Some of the shipwrecks date back as far as the 16th century BC with a range of artifacts housed in the various buildings throughout the castle. It was interesting seeing the development and transformation of amphorae through hundreds of years. One thing which always fascinated me was that amphora have conical bases. The thing which always stuck in my mind was, how did they transport them. Well the museum answered my question with a display of amphorae stacked into the hull of a boat. The conical bases were held in place by the beams in the hull whilst the tops of the amphora were lashed. The next layers bases fitted into the gaps between the row of amphora below. Throughout the various exhibits were different displays which helped to add sense to ancient life. In the coin museum a stone tablet ordered by Emperor Diocletian laid out the price of various items across the empire. There were also displays explaining how money transferred to goods in the ancient world. There were funerary displays, displays of armour and the knights, and a fabulous glass collection with light highlighting some magnificent ancient discoveries. 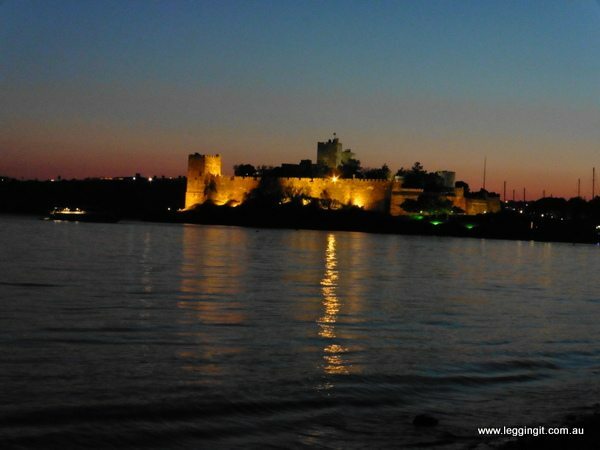 Bodrum Castle had some spectacular views across the harbour but the best part was the quietness of the place. Throughout the castle there’s lots of trees and shaded areas which really add to the calmness of the location. However, every now and then the silence is broken by the sounds of the resident peacocks. Overall we thought the price of admission was quite reasonable at 25 Turkish Lire and for an extra 5 lire we were able to visit Mausoleion Tomb Museum (Mausoleionn Anit Müzesi). Ever wondered where the term Mausoleum comes from? Well at Mausoleion Tomb Museum (Mausoleionn Anit Müzesi) we discovered the origin. Not far from the harbour on a hill overlooking the port in around 353 BC a most magnificent marble structure was built by Mausolus and his wife, sister Artemisia II. At 45 metres high it towered above the surrounding buildings. 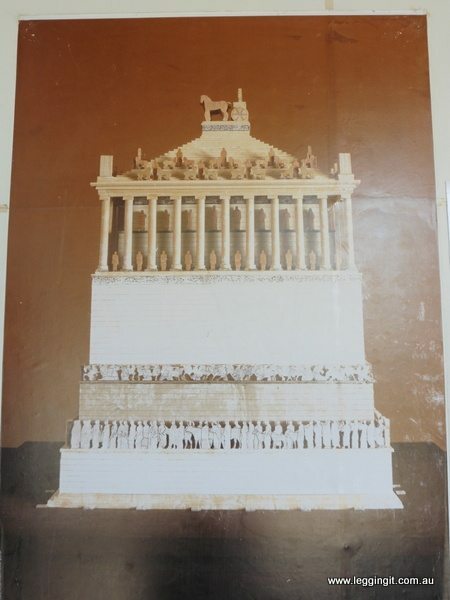 It was adorned with marble columns, carved statues and surrounded by a massive bas relief featuring battles of Greek wars. A massive bronze chariot topped the roof with four horses dragging it and Statues of Mausolus and Artemisia riding on the chariot. It was one of the seven wonders of the ancient world. 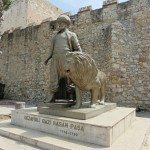 Mausolus and his sister wife Artemisia ruled their kingdom from Bodrum, formerly known as Halicarnassus. After Mausolus’ death his sister finished the construction of the tomb and after her death her ashes were entombed alongside her brothers. The tomb stood for over a thousand years until it was destroyed by multiple earthquakes in the 12th and 15th century. 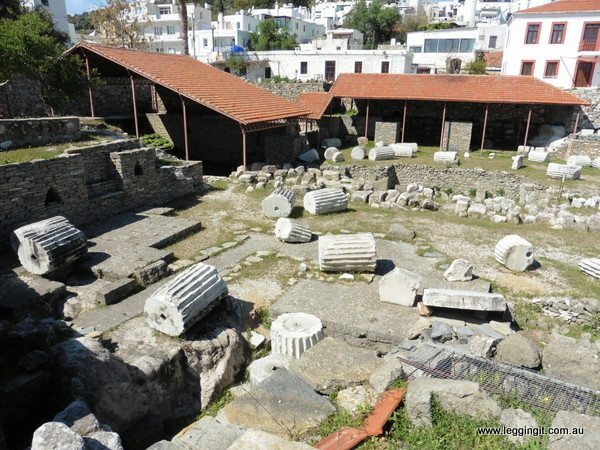 During the fortification of St Peters Castle (Bodrum Castle) in the 1400’s, the marble from the tomb was crushed and burned to use as lime for mortar. Rumour had it that when the knights were dismantling it they came upon the burial chamber late one day. They chose to leave it and explore it the next day. However, supposedly they arrived the next day to find the chamber had been raided, treasure removed and the sarcophagus’ disturbed. To reinforce the castle so much of the marble of the tomb was quarried that only a small amount of broken pieces remain. Some also was later removed and sent to the British Museum. However despite all the destruction, Mausolus’ legacy is that his grand tomb gave the name which is universally known as mausoleum. Within the exhibition hall at Mausoleion Tomb Museum there are fragments of the various parts of the tomb and a picture of what the tomb would’ve looked like. These days the tomb is just a big hole in the ground with assorted pieces of rubble. 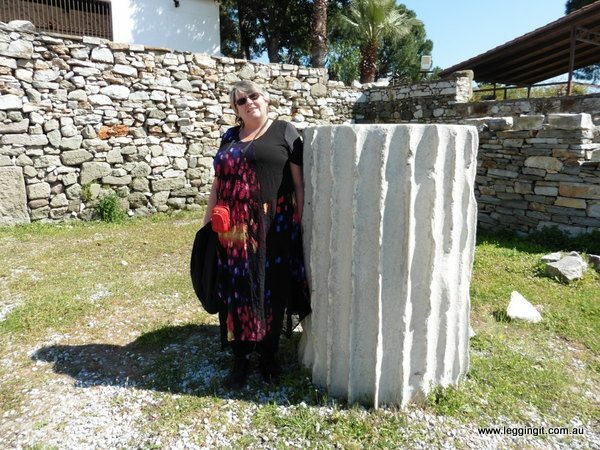 Standing beside a fragment of a marble column it was almost shoulder height to Michele. Mausolus’ Tomb has been the inspiration for various structures including Melbourne’s Shrine of Remembrance. It was an interesting visit, which cost less than the price of a coffee. 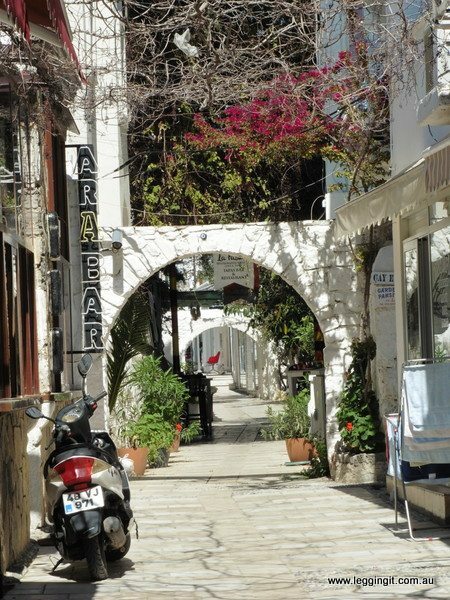 The main restaurant, tourist areas in the city of Bodrum,is the area surrounding the boat harbour and the next bay to the south. The boat harbour is filled with luxury cruisers, and massive wooden tour boats. Along the promenade facing the marina are all sorts of shops, hotels, luxury restaurants, cafes and nightclubs. Between the marina and the next bay a maze of streets is filled with all sorts of clothes, shoes, art and tourist shops. 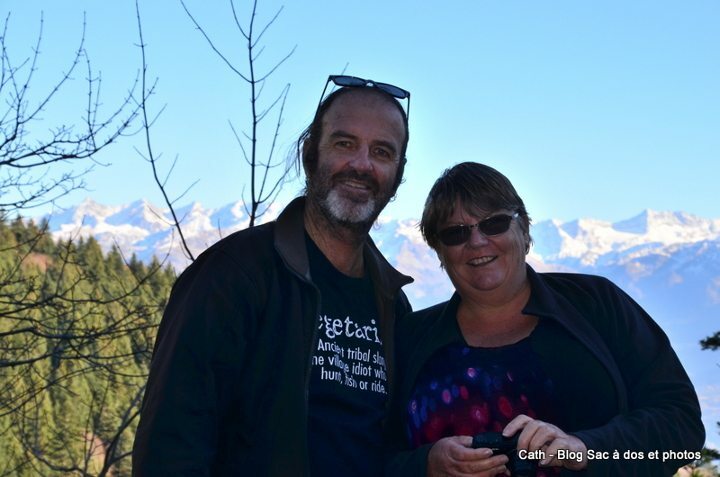 We took a wander through the area and were quite surprised how many shops were in the area. 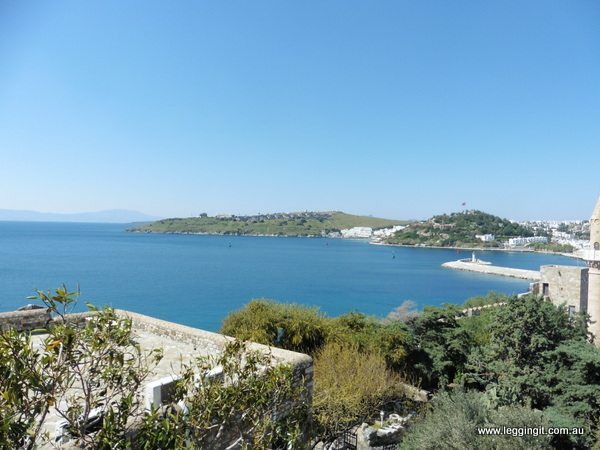 Along the bay to the south of Bodrum Castle restaurants, bars and cafe’s overlook the bright blue waters of the Aegean Sea. 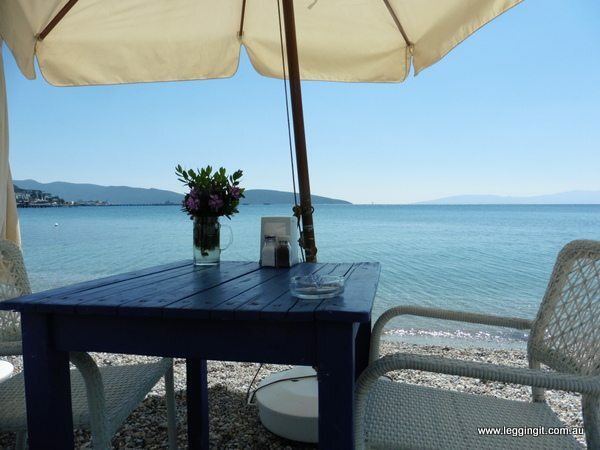 With tables and chairs right up to the waters edge we stopped at Barbouni Restaurant. After a walk along the beach and in the water it was the perfect place to stop for a coffee. The waiter, Muhsin made us feel right at home joking around with us. It was so relaxing that we booked a table for dinner. As the sun was setting we settled into a table by the waters edge and enjoyed a Turkish meze. We had a great night out, with good food, friendly service at the perfect location. As we were boarding the bike a drunken Turkish guy looking pretty rough approached us talking in Turkish. We explained we were Australians and he was so surprised. He’d seen all the stickers on our bike and had been stalking it to see who was riding it. Soon we were being introduced to his wife and he was taking photos of us. He wanted us to meet him tomorrow at the cafe to talk bikes so we’ll see how it pans out. 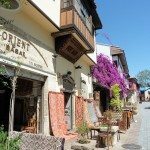 We’ve loved our brief stay in Bodrum, Turkey. 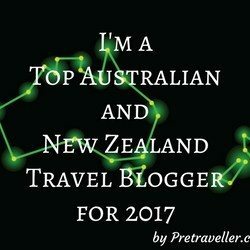 It really is a great place with a huge choice of restaurants, bars, cafe’s, beaches, cruises and a little bit of history thrown in. 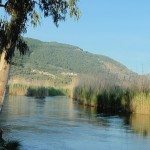 Tomorrow we head to Akyaka, a place recommended by friends of the housesit we are heading to.